Rats and people have lived together in cities for centuries. This close cohabitation has been problematic for people because rats have been the source of a number of diseases responsible for significant illness and death. Yet despite the fact that rats are thriving in cities around the world, and despite the fact that rats are known to pose a potential health threat for people, there is very little contemporary data on urban rat populations or rat-associated diseases. No where is this knowledge gap more obvious than in Canada, where there has never been a comprehensive study of rats. This is problematic because without a thorough understanding of rats and the diseases they carry, we cannot even begin to accurately gauge rat-associated health risks or to develop strategies to monitor and mitigate those risks. 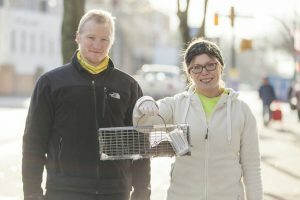 The goal of the Vancouver Rat Project is to address this knowledge gap by studying urban rat populations, the microbes they carry, and the risk that they could pose to people through the transmission of infectious diseases. The first phase of the project (2010-2015) is now drawing to a close. Click here to see a summary of what we have found so far, or click here to find links to our published manuscripts and summaries of study results. We found that many zoonotic pathogens were heterogeneously distributed among rat populations, but we don't have a clear understanding of why rats in some blocks had a very high prevalence of disease, while rats in adjacent blocks had a low prevalence of disease or were disease-free. We are going to try to determine whether disease distribution in rats is influenced by things like the environment, concurrent illness in rats (such as respiratory and cardiovascular disease), and rat genetics. By understanding these relationships, we will be better able to predict and reduce public health risks associated with rats. We know fleas are capable of transmitting some dangerous zoonotic diseases from rats to people, such as Plague, Bartonellosis, and Murine Typhus. We want to know if Vancouver rats are infested with fleas, how flea populations 'work' (i.e., how many fleas there are, what species of fleas are present, how they are distributed among rats, etc. ), and whether fleas are carrying any zoonotic pathogens we should be worried about.